The Minster Gate Bookshop Home Page. Our extensive stock of antiquarian and second-hand books is housed over five floors of a Georgian town-house and covers most subject areas. 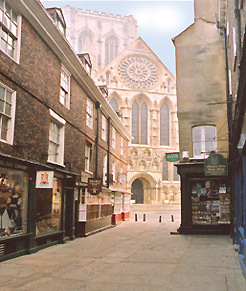 Minster Gates formed the entrance to the medieval precinct of York Minster, and is a street which has been associated with books and bookselling since 1580 and was formerly known as Bookland Lane. As general booksellers, we have also specialised in Children's and Illustrated books, Folklore and Arthurian literature for over twenty years and have issued substantial catalogues in these areas. Future catalogues will be included on this site. We also stock a range of old maps and prints, with an emphasis on lithographs and engravings of York and Yorkshire and the work of book illustrators of the period 1800-1940. The Minster Gate Bookshop is a member of the P.B.F.A., the largest association of antiquarian and second-hand booksellers in the world.